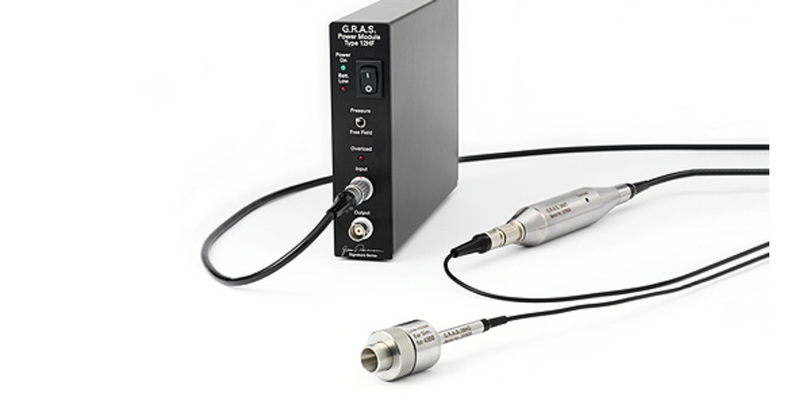 The GRAS 43BB is a low-noise, high-sensitive ear simulator system for measurements of sound pressure levels close to or below the threshold of human hearing. It consists of the well known standardized IEC 60318-4 ear simulator and the GRAS 40HT low-noise microphone system. 43BB has been developed to meet the consumer electronics industry's need for R&D testing of headphones, especially in-ear headphones with Active Noise Cancellation. Because it can measure down to and below the threshold of human hearing, it can measure the influence of the electronics on the audio response of the earphones. The low inherent noise of the system also means that correlation to subjective listening results is very good, and that THD and Rub & buzz at very low levels can be investigated. 43BB can be mounted in a monaural setup inside a KEMAR (45BB and 45BC) or a GRAS 45CA Hearing-Protector Test Fixture. Because of the length of the 26HG 1/4" Preamplifier, it is not possible to use 43BB in a binaural setup inside any GRAS test fixture. For binaural KEMAR setups, GRAS 43BB-1 is available. It is identical to the 43BB except that the preamplifier is mounted via an angled adapter. To mount the 43BB in a KEMAR, a standard ear canal extension such as the GRAS RA0237 Straight Ear Canal Extension Kit for KEMAR can be used. If mounted in the GRAS 45CA, a GRAS RA0172 Pinna Holder Kit can be used. Basically the 43BB consists of a Low-noise Ear Simulator and the 40HT low-noise microphone system. The Low-noise Ear Simulator is identical to the well-known standardized IEC 60318-4 (711) Ear Simulator, but the built-in microphone is the 40AH microphone which has a specially reduced inherent noise floor in order to achieve a large dynamic range. Its diaphragm is specially tuned to yield high sensitivity coupled with low internal-noise generation. The 40HT Low-noise Microphone System comprises the 40AH ½” Ext. Polarized Pressure Microphone, which has a specially reduced inherent noise floor, and the 26HG ¼” Preamplifier. The 26HG is similar to the GRAS 26AC ¼” Standard Preamplifier with 3 m integrated cable, but with a 40 GΩ input impedance to enable low-level noise measurements. It has an integrated lightweight cable terminated in a 7-pin LEMO connector that plugs into the 26HT Gain and Filter Unit. The preamplifier is connected to the ear simulator via the GR0010 Adapter. They are glued in place to ensure that dust and dirt do not jeopardize the low-noise capability of the ear simulator. To complete the system, a special power module is part of the delivery, i.e. the 12HF 1-Channel Power Module for Low-noise Systems. The acoustic input impedance of the Low-noise Ear Simulator is identical to that of the GRAS RA0045 Ear Simulator according to IEC 60318-4 and, as a result, loads a sound source in very much the same way as a human ear. It embodies a number of carefully designed volumes connected via well-defined and precisely tuned resistive grooves. In an equivalent electrical circuit, capacitors would represent the volumes, and inductance and resistance would represent respectively air mass and air flow within the resistive groves. The frequency response of the 43BB low-noise ear simulator system is very similar to that of a standard 60318-4 ear simulator below 10 kHz. Above 10 kHz, the differences in the microphone diaphragm impedance results in substantial differences. The standard ear simulator has a high-Q resonance around 13.5 kHz related to the length of the ear canal and the diaphragm impedance.In the low noise version of the ear simulator the single high-Q resonance is replaced by two resonances. A filter unit controls the mechanical resonance of the low noise microphone. The combination of the filter and the low damping of the diaphragm cancels out the high peak of the resonance in the simulator. 43BB must be connected to the 26HT Gain and Filter Unit which amplifies the signal by 20 dB. 26HT must be connected to the 12HF 1-Channel Power Module for Low-noise Systems. The power module provides all necessary voltages for powering the preamplifier and polarizing the microphone. Should you by mistake damage the diaphragm on a GRAS microphone, we will in most cases be able to exchange it at a very reasonable cost and short turn-around time. This not only protects your investment, but also meets your quality assurance department since you do not have to worry about new serial numbers etc. When leaving the factory, all GRAS ear simulators have been calibrated in a controlled laboratory environment using traceable calibration equipment. Depending on the use, measurement environment and internal quality control programs we recommend that the ear simulator is recalibrated at least once a year. An individual calibration chart for the ear simulator system is included. GRAS microphones are made of components from our proven standard portfolio and are all manufactured of high-quality material and branded parts that were chosen and processed to ensure life-long stability and robustness. This, together with the reinforced gold-plated microphone terminal that guarantees a highly reliable connection, enables us to offer 5 years warranty against defective materials and workmanship. The noise floor (solid line) is typically below the threshold of human hearing (dashed line).